I got this a few days ago but I was terribly busy so I left it on the dining room table where I last inspected it. A few hours later, Dennis came home and almost popped them into his mouth. He thought they were candy. That's how yummy they look in person! The Exotic Rocks package come in three different shades all designed to give you a natural, healthy looking glow. The trio is comprised of Lava Rocks, Hot Rocks and Glow Rocks. Hot Rocks (the pink rocks at the topmost) - Gives you a pretty pink subtle glow. I reckon this will look gorgeous on fair complexions or on days when you want to look as natural as can be but with a nice healthy glow to your face. Glow Rocks (center) - My absolute favorite of the bunch. To me, it looked like a perfect combination of pinks, corals and the slightest hint of gold. It's perfect on my medium skin tone. Lava Rocks (bottom) - This is the shade for days when you're after a healthy, rosy glow on your cheeks. This shade gave such a pretty flush to my face that I wanted to sleep and wake up in it. It adds just the right amount of depth and drama that you need and want. The Exotic Rocks trio is a product that I definitely recommend everyone to purchase. It is very easy to use, almost impossible for you to look overdone with or without good lighting. It blends perfectly and is very easy to apply. 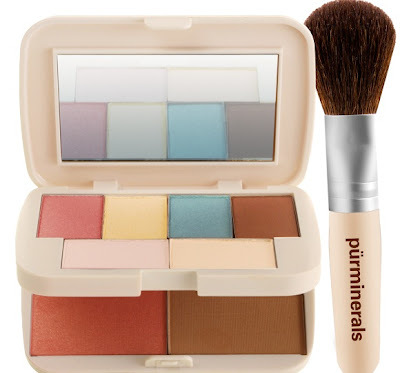 It is very flattering on ALL complexions plus I find it works better when you blend 2 or 3 shades together. For my event today which was a brunch affair, I opted to use the hot rocks and glow rocks together, I loved how perfectly natural my make up looked for a day event. I can definitely imagine Lava Rocks + Glow Rocks for an evening out and all three shades together is just awesome. Nothing major, I would just prefer if it was packaged in a different way. It's a bit hard to put back into the container when you're in a hurry cause all three have individual covers inside the slide out cover. Also, it's a bit shallow so some of the rocks spill out when you try to give a swirl, however, this is easily managed by just changing the container into little inexpensive ones you can find in daiso or dollar stores. Definitely doesn't alter or influence my over-all impression of the product in the least. Pur minerals is a great brand, as far as I'm concerned, I have never used a single product of theirs that I didn't like. I swear by my 4-in-1 foundation, it's all I use. Their lipsticks are awesome and their brushes are a breeze to use. With PUR, you definitely get your money's worth. They're high quality, totally safe, and last for ages! The addition of the Exotic Rocks trio into their product line is like adding icing to their already irresistibly delicious cake! I would definitely recommend this to everyone and I'm sure that once you try it, you would too! Caprylic/Capric Triglyceride, Octyldodecyl Steaoyl, Dimethicone, Silica, Magnesium Aluminum Silicate, Glyceryl Stearate, Talc, Nylon, Synthetic Wax, Zinc Oxide, Chlorphenesin, Potassium Sorbate, Tocopheryl Acetate, Xantham Gum, Tetrasodium EDTA. May Contain: Mica, Titanium Dioxide CI 77891, Iron Oxides CI 77491, CI 77492, CI 77499, Tin Oxide, Ultramarines CI 77007, Ferric Ferrocyanide CI 77510, Chromium Oxide Green CI 77288, Chromium Hydroxide Green CI 77289, Manganese Violet CI 77742, Red 7 Lake CI 15850, Carmine CI 75470. Contains Carmine as a color additive. Now available in all RUSTAN'S Department Stores! These look so cool! It's hilarious that Dennis tried to eat one! I bet he got a real surprise! :) I will have to try to find these somewhere so I can give them a test! I bet the hot rocks would work better on me since I have a fair complexion. Thanks for the review! Ooh la la the exotic rocks look amazing! Those Exotic Rocks look really interesting. Glow and Hot both look pretty! Those sound really cool! :) although I'm not a make-up (except lipstick) type of girl. And yeah, haha! Of course he did! But he doesn't recycle jokes, so he did "ting ting" but with another story. oh, and you should just get kermit tesoro shoes instead of the dsquared ones! haha! Can I ask what they taste like...? :/ Sorry, I'm just curious like that. >.<"
I voted for you btw! :) I hope it helps somehow. And goodluck! I don't know why my GFC unfollowed your blog! >.<" I already followed you since I first stumbled upon your blog. I was trying to figure out why I never saw your updates on my dashboard. They're like gum. :) Anyway, congrats on that look of the day feature! Join my giveaway! You can win an H&M dress! haha i would've thought they were candy, too! great review - i'll have to try pur products now - i haven't yet! Mineral make up!! I have to prove it.. thank you for your visit and comment! where do you buy this? is this a specialty thing or drugstore? don't recall seeing the brand! sounds nice, though! I thought for a second that those were candies! Love the makeup! it looks cute. unique. hopefully I can try this.